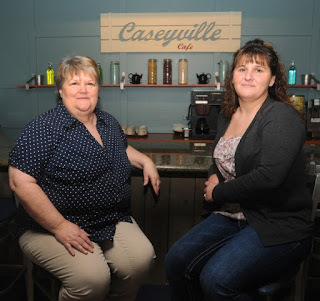 Chef Robert Irvine visits Caseyville Cafe, Caseyville, Illinois, where he finds Diane Emery and Robin Gordon, a mother and daughter who bought the restaurant three years ago. Whilst they were never making profit, they were breaking even until the restaurant took a downturn and they were losing $6000 a month. Robert quickly discovers that the restaurant is dirty, the kitchen isn't functioning and the staff are taking advantage. The restaurant is cleaned and given a refresh, a new stove was installed and staff were sacked. A few months later, the customer numbers were up, the service had improved and they had begun to repay their debts. The restaurant closed in January 2014. They had reverted back to their old menu prior to closing but had kept the other changes and appeared to have improved the service. This episode was episode 11 of season 5 and was aired on March 13 2013, there were 13 episodes in the season, airing between November 2012 to March 2013 and the season 5 closure rate currently stands at 93%.